Kareer.me is a website for job seekers that helps them manage their job search and create beautiful, trackable, web resumes that get noticed. 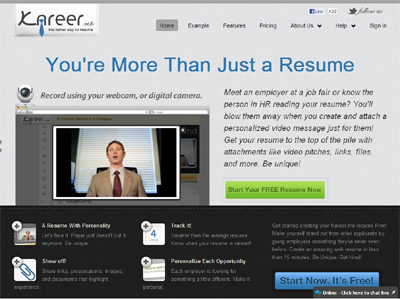 Easily create personalized web resumes for each job opportunity. Attach work samples, social profile info, and even a personalized video pitch to help you stand out from other applicants. Search thousands of local job postings and save your favorites. Create an online resume for a job posting in two clicks. Kareer.me is the better way to resume. Kareer.me is focused on giving the job seeker a home base to perform their entire job search from. The real magic is that Kareer.me allows you to create a personalized resume for each job that you apply to and track views, forwards, and other statistics about that opportunity.